By following, meeting and exceeding the stringent Uniform Tire Quality Grading system (UTQG) system, You may have noticed markings on the sidewall of your tyres for Treadwear, Traction and Temperature. These are UTQG ratings. The UTQG ratings originated in America to provide consumers with information to help them purchase tyres based on their relative treadwear, traction and temperature capabilities. All Passenger tyres and AWD/4WD tyres, with a Passenger construction, that are sold in America must, by law, have these ratings marked on the sidewall. Some tyres sold in Australia do not carry the UTQG ratings so you do not have the information to compare a tyre’s quality. A ‘standard' control tyre is assigned a grade of 100. The treadwear rate of all test tyres is compared to the ‘standard' tyre. For example, a tyre grade of 200 should wear twice as long as the control tyre. 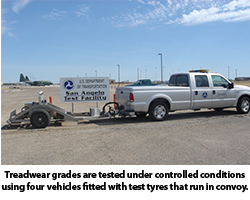 Treadwear grades are tested under controlled conditions using four vehicles fitted with test tyres that run in convoy. The vehicles repeatedly run a specified 640 kilometre road course for a total of 11,520 kilometres. Tread depths are measured every 1,280 kilometres and the measurements for each vehicle are averaged to give a projected wear-out life. Traction grades are an indication of a tyre's ability to stop in the wet. A higher grade should allow your vehicle to stop on wet roads in a shorter distance than a tyre with a lower grade. Traction is graded from highest to lowest as AA, A, B and C.
Temperature grades are an indication of a tyre's resistance to heat. Sustained high temperature (for example, driving long distances in hot weather), can cause a tyre to deteriorate, leading to blowouts and tread separation. From highest to lowest, a tyre's resistance to heat is graded A, B or C.
Starfire Tires not only received exceptional grades in all these categories, but they provide such great features as low noise, great stability and comfort for the driver.